From an early age, I always wanted to help people get well. I also knew that I didn’t want to be prescribing drugs or doing surgery. I was raised in a way that I knew that the body has an amazing capacity to heal. There were many things that pushed me away from the hospital and western medicine type thinking, especially seeing people on drugs and after surgery that weren’t any better than before. My curiosity for biology and anatomy and learning the relationship between the structure of the body and function of the body was what lead me, ultimately, to becoming a chiropractor. The most important lesson I’ve learned as a doctor is to never stop learning. Each patient that I see gives me a chance to learn something new and build on my knowledge to help the next patient. As a teenager I was dealing with stress and anxiety and worked to find the root cause of my problem, rather than mask it like many of my peers had done. I went to a chiropractor in my family who looked at all the various aspects of my health like my diet and overall structure. With targeted supplements, chiropractic treatments and other lifestyle modifications, we were able to fix the problem. After going through that process, it became my life mission to help my patients do the same. I attended Illinois State University where I graduated with a Bachelor’s Degree in Biological Sciences. Shortly after graduation I moved to St. Louis, Missouri where I attended Logan College of Chiropractic. In school, I focused my studies on advanced therapies and advanced techniques in areas like pregnancy and pediatric, sports chiropractic and neurological based programs so that I was able to help anybody that was under my care. I recently moved to the west Michigan area after Chicago and ended up working for a typical, traditional chiropractor. 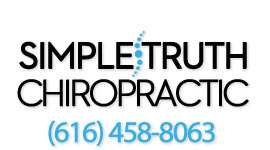 I got frustrated with the lack of emphasis on custom based care and the fact that we were doing the same thing on every single person that walked in the door and I decided to move on and find an office in which I could foster my skills as being the best doctor possible, which is how I ended up at Simple Truth Chiropractic.